Amin Koh cuts off the excess rubber off his client’s shoes and says proudly that only a professional cobbler can do such a neat job. “A professional cobbler will cut off the excess of the shoe’s sole without breaking the rubber. 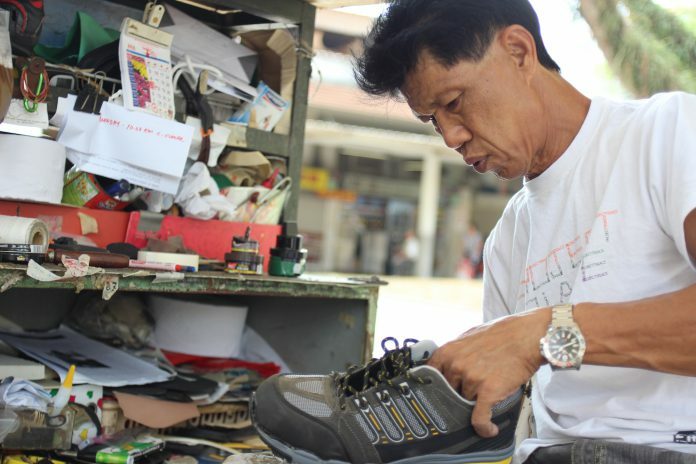 If it breaks, then he is not a professional cobbler,” the 61-year-old says. Coming from a family of seamstresses, Koh has always been good with cutting and sewing. He passes the shoes back to his client, who takes takes them without a second glance. Nearly everyone in Commonwealth Drive knows Koh. He has been in the business for 13 years, without a day’s break, at the same location. “Most of my clients see that my service is good, they always come again.” Koh’s clients include professionals and his elderly neighbours at Commonwealth Drive. “Most cobblers are in this trade to survive, to make ends meet. But I take pride in my work,” he says. He did not keep his skills to himself; he took younger people under his wings to impart his knowledge to them. With some disappointment to boot. “I don’t think I will teach anyone anymore. I had two disciples. One was really good at cobbling, maybe even as good as I am. The second one was not very good. But they are both very arrogant,” he says. It was six years ago when an old lady begged him to take her son under his wings. The middle-aged man was just out of prison. “The second one was no better. He was not as skilled as the first but he never came back after learning the trade from me. He even started a stall at Commonwealth MRT. Not far away from here! He promised me not to open a stall near me. He went back on his word,” Koh recalls angrily. “At first I wanted to punch him,” he adds. Though he has let the incident rest, Koh admits he still feels sour about his two former assistants. “You know, I want to help people. I have been poor before. I got retrenched 14 years ago [as a senior supervisor at a construction company]. Until I became a cobbler, my two-year-old son and me, we suffered,” he says. His wife passed away in 1999. During that time, Koh braved the police and sold chicken wings illegally in Geylang. “No money! What you want me to do? Go out there and rob?” he recalls.